The use of Hibiscus tea is thought to have started in ancient Egypt. In the Arab world, the tea is known as "karkady" or "karkade." Made from the flowers of Hibiscus sabdariffa, this drink is served in homes and restaurants, particularly in Egypt. It is also popular in several other countries and has made its way into the United States. 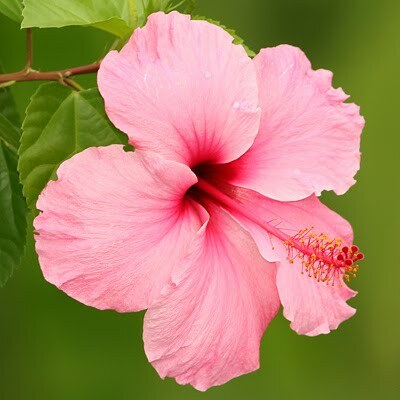 The reason for the wide acceptance of this tangy and tasty potion could be the several medicinal properties of the Hibiscus flower. The flower is rich in vitamin C(good for colds), helps to increase appetite, has laxative and diuretic effects, improves circulation and helps in reducing cholesterol. Hibiscus tea can be served hot or cold and is made from fresh or dried petals or "calyx." There are a number of recipes -- some are simple, while others are more complicated. Normally, spices like cinnamon are added. A simple method to make the brew is to pour one cup of boiling water over half a calyx or 1-2 table spoons of petals, cover and strain after 5-10 minutes and sweeten to taste. Add honey, lemon, orange peel or juice if you like. For a fruity punch, blend with dried fruits. Hibiscus can be mixed with regular tea also. Often, a recipe can be improvised or a new one found. One of the easiest, yet most time consuming, is the Sudanese method. Dried hibiscus flowers are soaked in water for two days and strained -- no boiling is involved. Finding Hibiscus flowers should not be a problem. They are available in several natural food stores. Fresh, organically grown products are the best and clean Hibiscus leaves are preferred. Alternatively, Hibiscus tea bags are available in sachets and boxes in stores or by mail order.